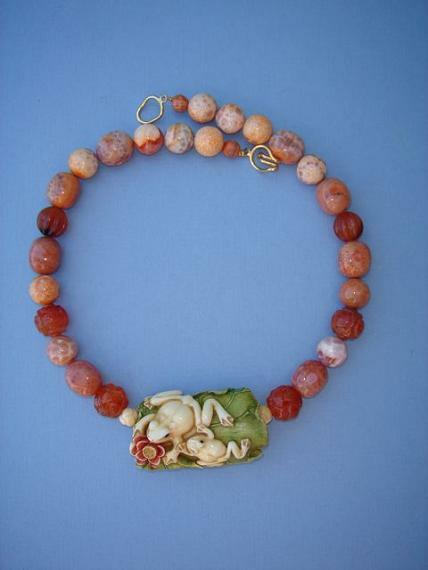 Approx 20" long including frogs, frogs are 2 1/4" x 1 1/4"
This unique necklace is made with deep orange carved carnelian and fire agate beads and a mammoth ivory piece that id two frogs on a green lily pad with a red orange water lily. This interesting necklace can be worn with both casual and more dressed up outfits. It is a great conversation piece. Carnelian has a long and storied past, and was once considered strictly the property of the noble class. People holding a high social status were often buried with this gem stone.